Heart Sound Segmentation using Deep Learning - A doctor in making? Home Deep Learning Heart Sound Segmentation using Deep Learning – A doctor in making? The idea of doing a project on heart sound segmentation came from a recent breakthrough I heard over the internet. One of the influencers I follow – Andrew Ng published a research paper a while back – which essentially is a state-of-the-art method for detecting heart disease. It was an intriguing idea for me, so I went through all the materials published on the subject to understand what was the original idea behind. To keep the story short, the authors said that they used deep learning – a technique which has been in the news for a while now, for extracting the patterns that experts used to identify a diseased patient. This algorithm after training, became so good at the task that the authors claim to surpass even seasoned doctors. This idea influenced me that even I – albeit small – could have an impact on the substantial advancements that these researchers are having! This article focuses on audio segmentation problem in ECG signals and how we leverage deep learning to solve the task. I will first discuss a bit about segmentation problem in general and then show you the ways that can be used to solve the problem. I will also discuss what “heart sound” is and then show you an implementation of heart sound segmentation. What is a Segmentation problem in general? Understanding our problem – What do you mean by “Heart Sound”? What is a Segmentation problem (in general)? Before we dive into heart sound segmentation, let us go back and understand what segmentation problem entails. Segmentation literally means dividing a particular object into parts (or segments) based on a defined set of characteristics. This object can be anything – ranging from concrete things like a frame of an image or an audio signal, to abstract objects like market or consumers. You may ask, why would you segment objects? The answer is simple – if you break down an object, it becomes an easier task extract information from it. For example in Customer Management, working with averages never reveals actionable insights until broken down in segments. 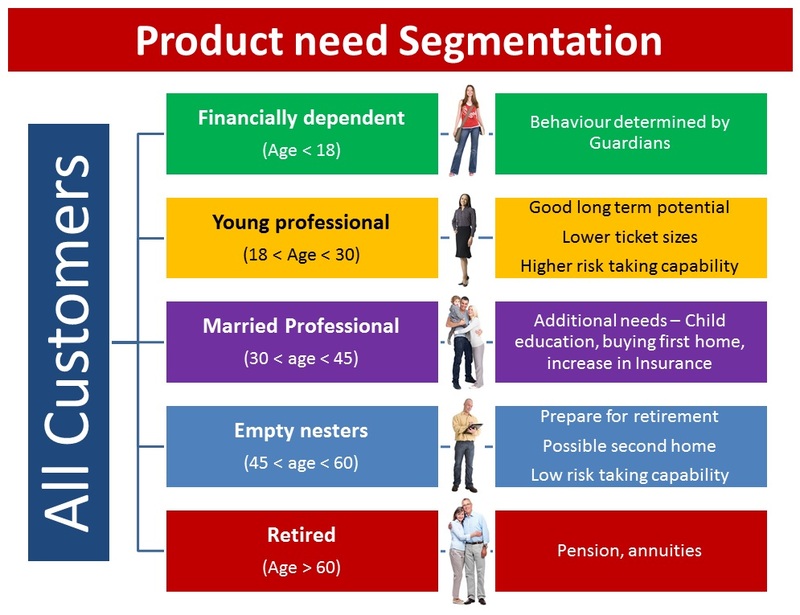 As mentioned in the article, this is an example of customer segmentation of credit card usage on the basis of their age. Now that you know Segmentation as a problem, let us understand the approaches to solve a segmentation problem. 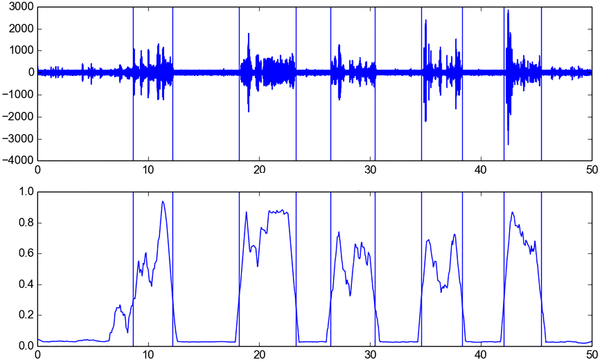 Segmentation, specially for audio data analysis, is an important pre-processing step. This is because you can segment a noisy and lengthy audio signal into short homogeneous segments, which are handy short sequences of audio used for further processing. Now to solve a segmentation problem, you can either do it directly using unsupervised methods or convert it into a supervised problem and then group it according to its class. To explain this more intuitively, lets take an example of Image Segmentation task. Approach 1: From each pixel of the image, find out the pixels which are close to each other and have an approximately similar color. You can cluster these pixels together to form a bigger picture of an object. In the example below, our cat is mostly greyish white. So it would be easier to find the pixels and segmenting the cat out of the image. This is an unsupervised approach to segmentation. 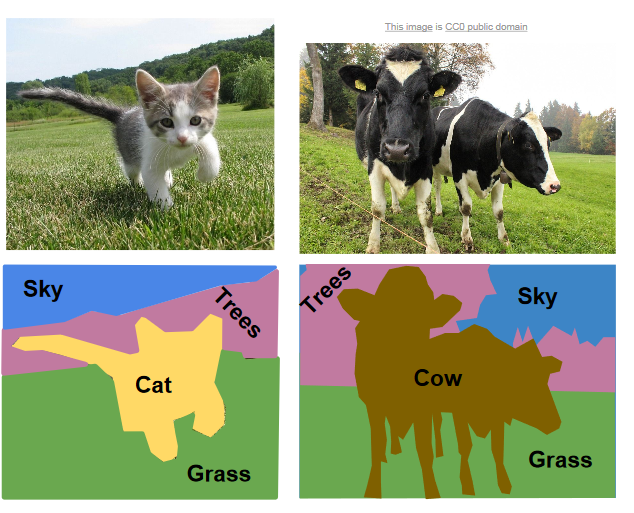 Approach 2: Train a model by giving it explicit examples of the classes belonging to the image – specifically a cat, trees and sky. Then get the model predictions on which class is present where in the image. This is a supervised approach to segmentation. Although both the approaches has its pros and cons, the decision to start out with either of the approach will depend upon how hard it is to get training examples to go on with the supervised approach. According to the World Health Organisation, cardiovascular diseases (CVDs) are the number one cause of death globally: more people die annually from CVDs than from any other cause. An estimated 17.1 million people died from CVDs in 2004, representing 29% of all global deaths. Of these deaths, an estimated 7.2 million were due to coronary heart disease. Any method which can help to detect signs of heart disease could therefore have a significant impact on world health. This challenge is to produce methods to do exactly that. The task in the challenge is to find a method that can locate sounds particular to a heart (aka lub & dub, which are technically called S1 and S2) within audio data and then segment the audio files on the basis of these sounds. After segmenting the sounds, the challenge then asks us to produce a method that can classify heartbeat into normal and diseased categories. For the purpose of this article, we will take up only the first task of the challenge, i.e. to segment heart audio. We see that there are cycles of heartbeat, with a higher intensity sound followed by a lower intensity sound. When we create this data, a bit of pre-processing is required. First is to make all the the extracted samples of same shape, second is to normalize the data and third is to create appropriate X and Y for our deep learning model. We are restricting the training for only 1 epoch here. But you can increase this to make your model perform better. I hope this article gave you a glimpse of how advancements in audio analysis can help us creating amazing technologies that can change our lives. The possibilities it opens up for humans can be huge. I have specially included an implementation of the technique so that you can use it to try it out locally. If you find the article helpful or have any suggestions, do let me know in the comments below! You are doing wonderful work. Have you written a journal paper based on this paper already? Which courses do you offer that can empower me with this knowledge. Perhaps, I need to send you my CV to see what I have done, for you to be well informed in giving me direction. Thank you. Hey James! Thanks for the kind words. Nice and informative article. Enjoyed reading. Thanks for writing such an wonderful piece. Need a small clarification, Atraining_normal_seg.csv contain some values of S1 and S2. Can you briefly elaborate what these values indicates and what is the unit of these values. Can you also share the code to predict and plot the last two graphs. Sure – I’ll add it in due time. I’d be interested in that too! Can you please write the code for doing the same exercise in R. I am more comfortable with R than Python and want to do the same exercise in R.
How did you get the last two graphs? Could you share the code. Didn’t reduce training loss to less than 8.3 for me? And predicted everything as 1. Help please!! I would like to kindly second what sushil shah said – could you please make a follow-up post explaining how to use the trained model to make predictions as you showed with the plot? It’s a rather unique method and there doesn’t seem to be any other sources for such a task. First: my training gives me always accuracy =8.3384 and accuracy=0.477 and it never change ever with the different epochs . And second, can plz provide us the code to plot the last two figures, it’s so important for me .